The face of your business should always look its best and with glass replacement and repair services from Clayton's Glass, it always will. The often large-scale replacements involved with commercial glass repair can prove a daunting task for many glass shops in the Texas panhandle. Clayton's Glass provides the very best equipment operated by some of the best installers in the glass industry to guarantee a reliable glass replacement every time. Contact Clayton's Glass today at (806) 373-2000 for a free commercial glass quote. Planning to remodel or renovate your commercial space? Call Clayton's Glass at (806) 373-2000 for a no-obligation glass quote. We are ready to work directly with your contractor or builder to ensure your new glass is ready to install on time and on budget. Short of a large-scale renovation or complete remodel, Clayton's Glass offers several opportunities to improve your commercial building. Add window film to your glass storefront. Window film from Clayton's Glass provides an increased level of comfort under the hot Texas sun. The latest window films provide UV protection, reduce solar heat gain, reduce glare, and are available in hues from perfectly clear to nearly black. 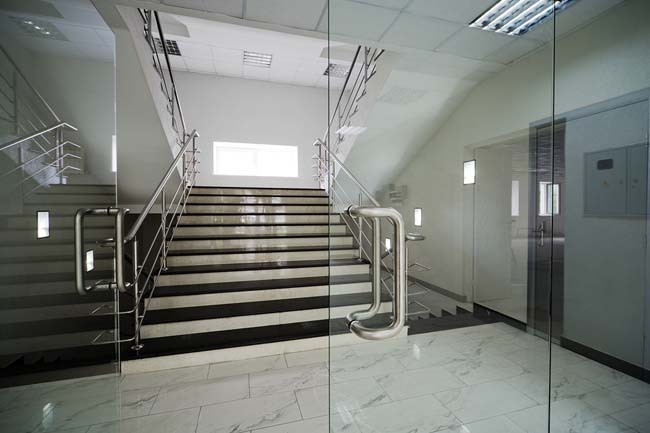 Enhance your business entranceway with a stainless glass door. Stainless glass doors are relatively new to the glass industry, but their popularity has quickly made stainless glass doors one of Clayton's Glass' many specialties. Clayton's Glass is truly a full-service glass shop. No matter the break, Clayton's Glass has or can make the perfect replacement. From windows and doors, to display cases, glass shelving, museum exhibits, glass storefronts and even aquariums, Clayton's Glass is the Texas Panhandle's source for all your glass needs.